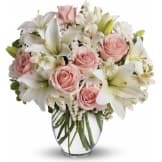 Send your condolences on the loss of a lovely lady with this feminine bouquet of light pink sympathy flowers. 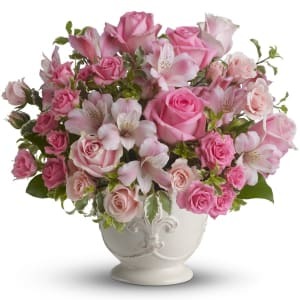 The pretty pink arrangement is a heartfelt choice. • A feminine mix of pink roses, pink alstroemeria and green pitta negra are presented in a charming French Country Pot. Flowers will be received by a Vandenberg Funeral Homes' staff. A member of family sent a picture he had taken of arrangement. They were even lovelier than the website picture. Pink was the loved one's favorite color and they did her proud. The flowers looked exactly as pictured. And customer service was fantastic answering my questions. My son says that it was beautiful. It looked like it had a lot more greenery in it than what was in the picture. I think they were pleased with it. Thank you. Received many compliments on the beUtiful flowers. All of our flowers are designed and delivered by hand from a local florist in in Tinley Park.